Dartford Harriers has a rich history, dating back to the club was established in 1922. We have produced the timeline below to highlight some of our key milestones. We are keen to grow this timeline and would welcome any additional contributions. If you have any images or stories you would like to share, please do get in touch. 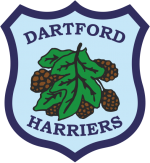 Dartford Harriers was originally founded as a Rugby Union Club in 1922 but, the rugby players in an effort to keep fit, started to take part in cross country runs. As the running became more popular with the players the rugby was slowly dropped and Dartford Harriers AC was born. The lasting legacy from the clubs rugby playing days is the Dartford Harriers running colours. The rugby players simply removed the sleeves from their old rugby shirts to create running vests, in doing so created the famous blue and blue “hoops” that can now be seen worn by the current crop of Dartford’s finest athletes. The pre world war one years saw the club, then based at Hesketh Park, enjoying a sustained period of success with some to the Harriers being considered for places in the Great Britain team that went to the Berlin Olympics in 1936. During the 1950s, the club slowly grew from the 12 athletes in the mid 40′s, into a strong cross-country squad that maintained the ‘harrier’ tradition. By the 1960′s Dartford Harriers had their first of many International athletes. In 1967, Maureen Conlan became the first Dartford Harrier to gain an International Vest when she represented Ireland in the very first Women’s International Championship which was held in Wales. on 8th June 1968 the club moved to the new cinder track in Central Park with their new clubhouse, another large garden shed. Ever since that move Dartford Harriers has been based in Central Park, Dartford. With training now taking place on the track, the club was able to introduce a detailed and extensive coaching programme for younger athletes which helped the club develop a solid structure and saw a boost in the clubs membership and performances. In 1984 worldwide media attention was drawn to Central Park when a young athlete made her British debut. That athlete was Zola Budd. A young girl, born in South Africa but who had become a British citizen. At this time South Africa was still banned from worldwide sport due to apartheid. A crowd estimated at around 5,000 people turned up to watch Zola run her first race on British soil on the Dartford track which was still at that time made of cinder. The race was shown live on BBC One’s Grandstand programme, was the main news item on all the TV news programmes and front page news in all the newspapers. Zola Budd set a women’s track record of 9:02.6 for 3000m in that race, a time which is unlikely to be beaten for many years to come. The 1985 London Marathon saw club members Sarah Rowell & Sally-Ann Hales finish 2nd & 3rd respectively. With Elaine Payne coming home close to the front of the field, Dartford Harriers won the Womens team prize. Dartford Harriers remains the only UK club to have had two runners finish in the top three in the same race at the London Marathon. Sarah Rowell had also come third in the 1984 race which led to her representing Great Britain at the marathon distance in the 1984 Los Angeles Olympics where she finished 14th in a time of 2:34.8s. Now in the 2000′s the club has a number of highly talented young International athletes that place the club in a strong position to push it into the higher echelons of UK athletics and towards a bright new future.